Blurb: Budding designer Lola Nolan doesn't believe in fashion . . . she believes in costume. The more expressive the outfit-more sparkly, more fun, more wild-the better. But even though Lola's style is outrageous, she's a devoted daughter and friend with some big plans for the future. And everything is pretty perfect (right down to her hot rocker boyfriend) until the dreaded Bell twins, Calliope and Cricket, return to the neighbourhood. When Cricket-a gifted inventor-steps out from his twin sister's shadow and back into Lola's life, she must finally reconcile a lifetime of feelings for the boy next door. Review: Last year, one of my absolute favourite books that I read was Anna and the French Kiss- honestly, even just thinking about that book brings both pain and happiness to my heart. 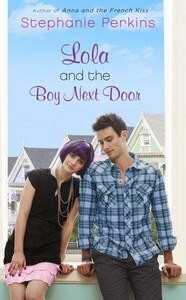 So when I think back on Lola and the Boy Next Door as I write this review, those feelings are pretty much the same. There are so many aspects of this book that I want to talk about so this review will be sort of split into several parts. The first being, characters. I love Lola. I’m just going to start off with that. Lola is quite the opposite to me, she loves her costumes and standing out and she’s quite dramatic, which just isn’t me at all. This being said, I really enjoyed reading about her and her life. I will say that Anna is still my favourite- speaking of which, I did a crazy little happy dance when Anna and Etienne made a cameo in this book. I liked that though this was the story of Lola we were still able to connect with Anna and were shown how her life had developed after the end of Anna and the French Kiss. I’m very excited to see how Anna and Lola may be able to fit into the third book of the series. I adored Cricket as well, from the absolute first moment I just thought he was so cute and funny, there were moments where I wanted to whack him in the back of the head with a very heavy book but I still loved him. (This being said, once again, he will never quite replace my love for Etienne St Clair). Of course, I absolutely hated Calliope Bell which is just the only reasonable feelings you could have towards the horrible thing. Like with Anna and the French Kiss, the entire plot isn’t about the romance between Lola and Cricket. There is actually a much stronger message in this book than you’d expect from your usual young adult/chick lit kind of book. It’s about believing in yourself and becoming the kind of person you want to be, it’s about caring for your family and friends no matter how very messed up they might be. This is why I loved this book so very much and will continue to try and force absolutely everybody in the world to read both this book and Anna and the French Kiss. Oh, you haven’t read either of them? GO! NOW! Don’t come back until you are done, possibly with tears in your eyes and a very aching heart. Honestly though, I really do recommend that you give these two books and the third one (named Isla and the Happily Ever After, to be released May 2014) a go because they are really quite brilliant. Even if you aren’t a fan of contemporary romance novels (I’m not really), I promise that you won’t be disappointed.